Once the garage was done, I started building cabinets to store all my woodoworking gear. 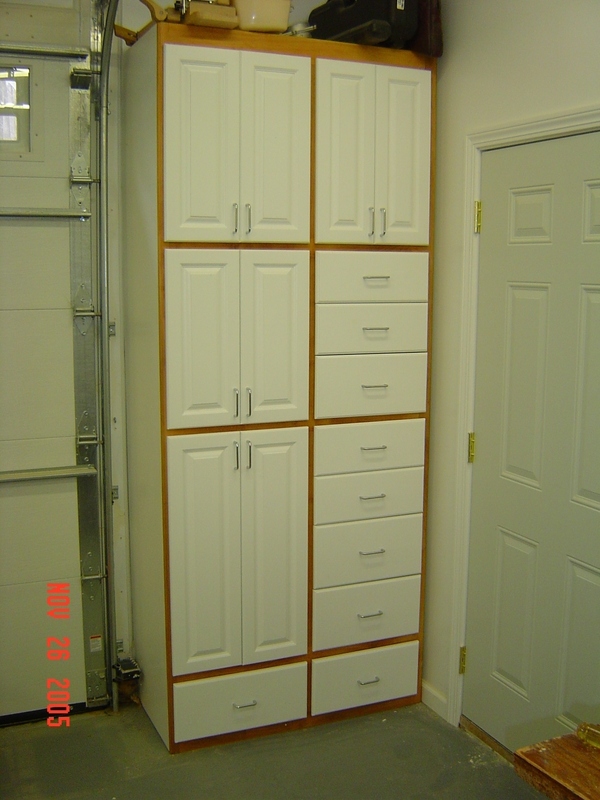 All the cabinets are similar to the one in the picture. I like to use maple because it is tough. I like the look of raised panel doors. Once you make a few (hundred) they are really easy to do. 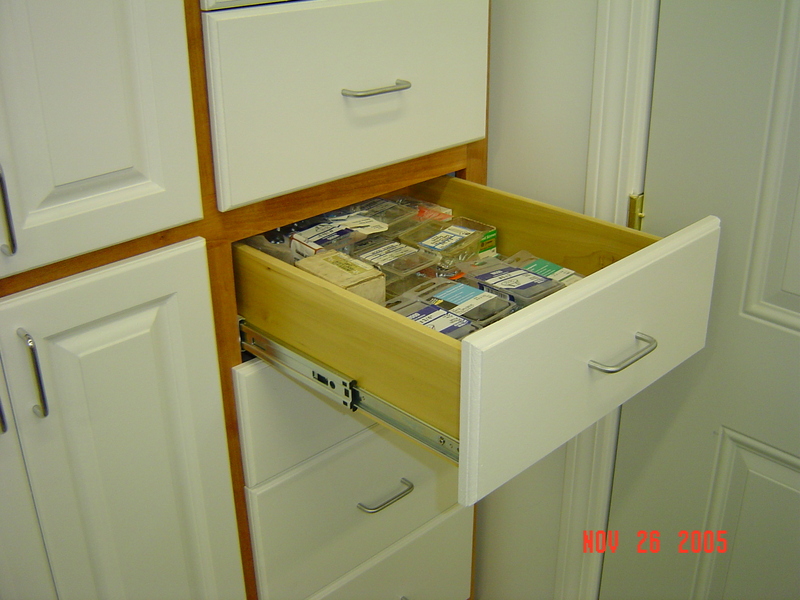 Drawer are always mounted with full extension slides. 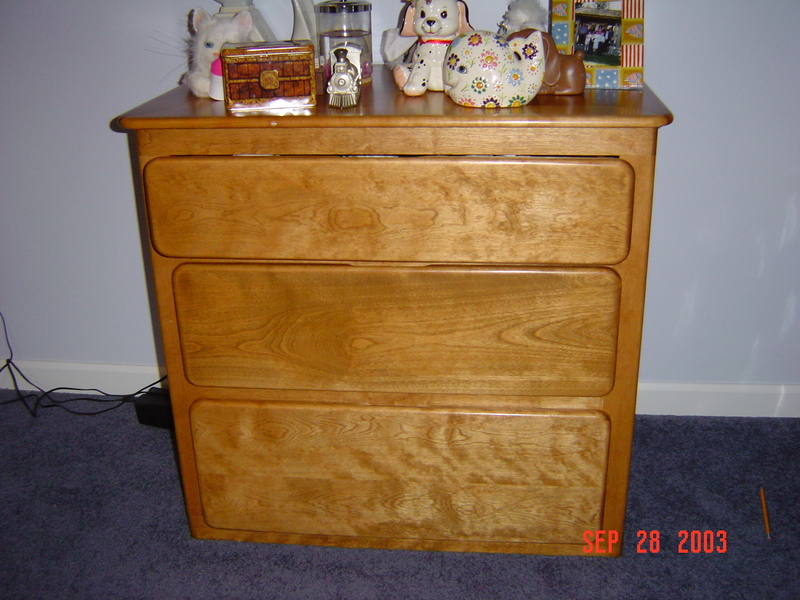 I finished up my son’s bedroom set by build a corner desk and three drawer dresser. The material again was birch and I matched the design rounding all corners with no exposed pieces of hardware. I must have finished the bed set sometime in 2002 or 2003. This furniture served us well but in 2009 my son finally grew out of it. I ended up keeping the desk for my wife’s hobby room and I sold the bedroom set to a college student for a couple of hundred dollars. In 2002 I moved to Connecticut. 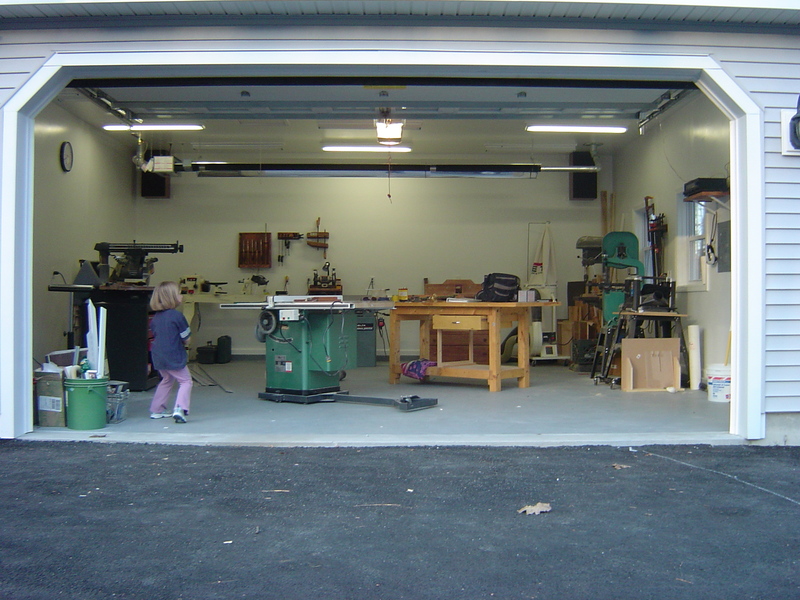 I confiscated a portion of the basement for a woodworking shop but it soon became apparent that it would not do. I decided to build another garage and recreate my workshop. 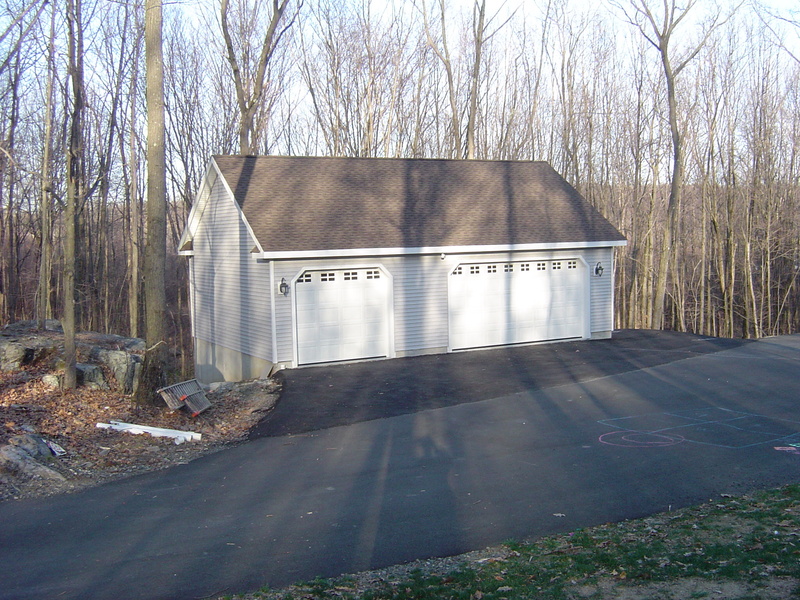 Below you will see a picture of the finished workshop. It is a long story and I have dedicated a page called “The Work Shop” to explain what happened from start to finish. A friend of mine posted a comment about his woodworking experience. He like turning bowls on a lathe. It turns out that the next project in my history is turning candle holders. 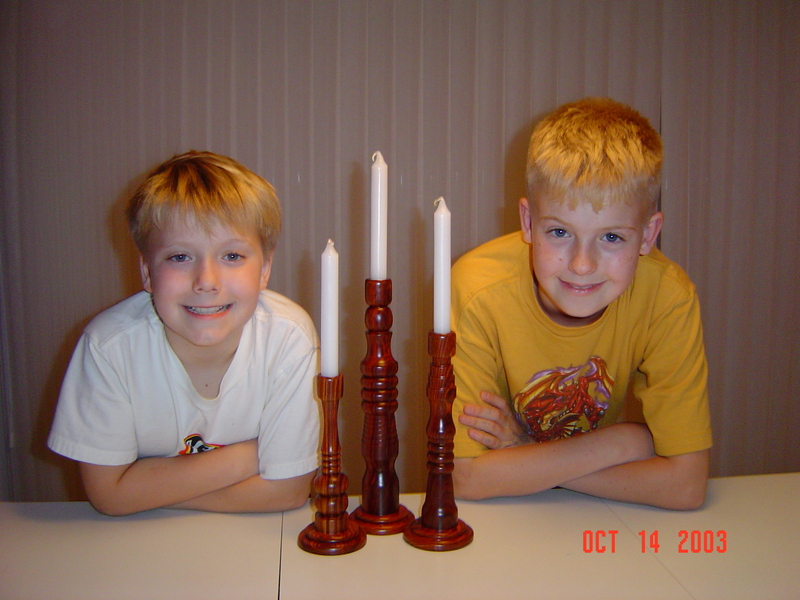 The picture below is of my boys and the candle holders we made together. They presented these as a gift to their Aunt Gail. The material is cocobola. Great turning material. Everyone who owns a lathe ends up making a lot of bowls. Here are some of mine. The material is walnut. The next couple of years I was busy with a new home and I did not have much time to build furniture. I did build a custom three-tier deck with a hot tube and a 12 ft tall play set for the kids in the back yard. Once these things were done, I got back to building furniture. The next major wood working project was a captains bed for my youngest son. 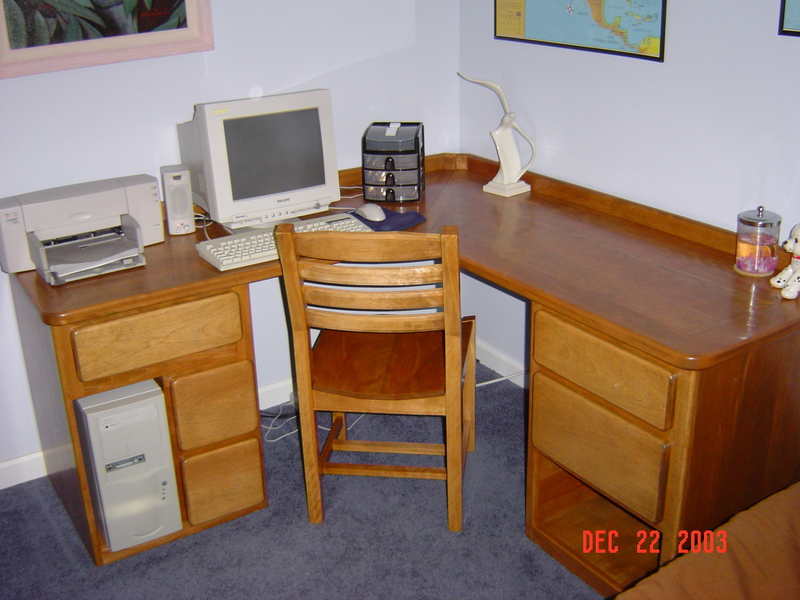 I took the photo in 2003; however, I build the bed somewhere around 1995 or 1996. The design came out of a woodworking magazine. As I remember, there were a number of projects that I built out of that one magazine, but the bed was the most ambitious. This is called a “Captain’s Bed.” All the corners are rounded and there are drawers integrated under the mattress inside the bed frame. This seemed perfect for a little boy. The bed is made out of birch. This is the first time I used birch on a woodworking project. I had to go to a mill and special order the material. This was also a first in my pursuit of woodworking. Later you will see that I built a matching dresser and desk. This will be a post for another day. I recently sold the bed, nightstand and dresser when my son decided after 13 years in the bed, it was time to upgrade to another bed. I found another picture of the bed just before I sold the set (2009). This will give you a good idea what the three-piece set looked like and how it functioned. Not bad considering I started this around ’96 and I sold it in 2009! So this is how it all started……Back in 1992 my father gave me a clock kit. It consisted of a clock movement, a set of plans and 1 x 10 x 10′ prime walnut board. My father wanted to do woodworking; however, he never seem to find the time to do it. He offered the kit to me stating that he would never get around to building the clock. I was intrigued at the thought of build the clock. 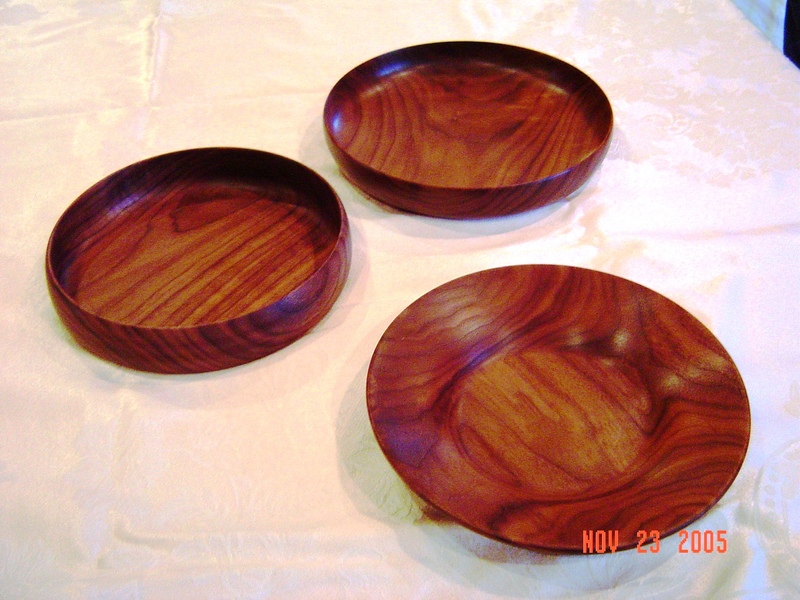 I had never worked with walnut and I believed I was capable of excellent work. Unfortunately, right after I received the kit, I was transferred to Rochester, NY from Detroit Michigan. It took several months to get established and finally I started working on the clock. I had a small workshop in the basement of my new home. In retrospect it was a terrible place to do woodworking. I bought another walnut board ($100). My second attempt was better but still not acceptable. I finally finished the clock in 1994 and judge for yourself but I think it turned out pretty good! I presented this clock as a gift to my father in February 1994. When I gave it to him, I asked to get it back when he passed away as part of his will. In 2003 (the year I photographed the clock) my dad passed away and the clock was returned to me. The clock sits proudly in my office. I look at it every day. It reminds me to think of my father and it was the beginning of a life long passion. I will publish a larger picture of the clock and follow-up with the next story later this week.